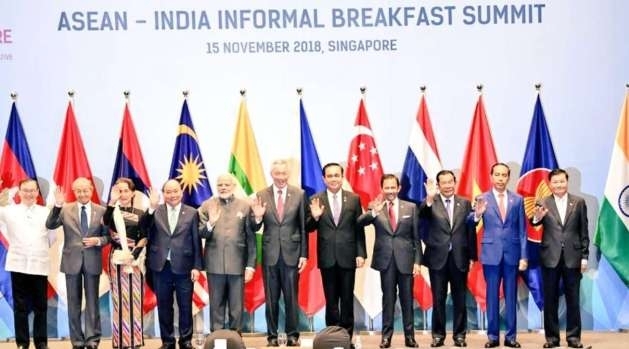 Singapore, Nov 15 (IANS) Prime Minister Narendra Modi on Thursday reaffirmed India's cooperation in the maritime domain during a India-Association of Southeast Asian Nations (Asean) Breakfast Summit here. The Asean comprises Brunei, Cambodia, Indonesia, Laos, Malaysia, Myanmar, Singapore, Thailand, the Philippines and Vietnam. In January 2018, India hosted the Asean-India Commemorative Summit to celebrate 25 years of dialogue partnership, 15 years of summit-level interaction and five years of strategic partnership.